With Affiliate Summit* only three sleeps away, the All Inclusive Marketing team is getting really pumped to meet, network and engage with existing and new affiliates, partners and clients. Also, with four new team members joining the AIM team over the last month, and with both Jon Levine and Carolyn Kmet making guest appearances at the show as Emcee and Panel Speaker, here are 10 people to keep you eye out for representing AIM this year. But first! You are an affiliate looking to join great programs with solid content and products that will engage with your audience and help you drive your affiliate revenue and profitability. You are a merchant / advertiser looking for marketing help or advice with your program, either to grow it through new channels, optimize it for higher profitability and new customer acquisitions, or get strategic guidance and insight. A major highlight for me personally was sitting amongst my friends and colleagues at the Pinnacle Awards, the most competitive and prestigious awards in North America within the Performance Marketing Industry, watching people I love and admire win awards. Two of our team members have already won awards in past years for “Affiliate Manager of the Year” and “Affiliate Marketing Advocate of the Year” and we were honored and thrilled to be listed in the top three Performance Marketing Agencies of the Year. Thank you you to Shawn, Missy and those who were rooting for us for that amazing opportunity! I had the pleasure of taking a fun topic and brining it to life in 18 minutes or less in my session “How to Diversify Your Affiliate Portfolio for Better Results!”. I had Amazon, Identity Guard and other big brands in my session, all of whom approached me after to discuss their program growth opportunities. Ashley Coombe, our social media strategist, also got to speak on a panel about How to Market your Business with Data, Not Feelings, which looked at “tips, tricks, and hacks to use data to drive efforts in your marketing processes, on site optimization, and social media.” The questions in that session were plentiful and they got some great interaction from the audience. If you have never been to an affiliate summit, or you’ve been to 20 and know a ton of people already, one of the best things about it is you get to meet awesome new people. This industry is entirely built upon relationships and even 10 years after my first summit, I’m still meeting people who’ve been in the industry as long as I have (or longer) that I hadn’t had the pleasure of crossing paths with yet. This summit I walked away with a handful of really great new friends and partners that have already improved the quality of my life and my business entirely. As an agency we speak to many prospective clients throughout the year. At times, it’s hard to feel comfortable moving forward without having that handshake or face to face eye contact, which Affiliate Summit creates in a comfortable and relevant environment. We were able to move forward with some business we have been exploring with prospects as a result of several face to face meetings, and I imagine many more companies, retailers, affiliates, networks and service providers were able to do the same. For those of us who have been in the industry for a long time, one of the greatest values of Affiliate Summit is being able to foster closer working relationships with strategic partners. Every company we speak to and engage with throughout the year related to affiliate marketing is at this show, and it’s awesome to spend one on one time with people we work with to get updates, negotiate terms, learn more about and grow with. We had several clients attend the show, both whom we represented and who came to learn, network and engage with us. We had the pleasure of spoiling them for breakfast, lunch and / or dinner and give them a quiet place to sit and relax during the day. We also enjoyed watching our clients engage with affiliates and partners directly and see the excitement build as they learned more about each person and how they could work together. All Inclusive Marketing held a private invite-only brunch with 20 special guests – affiliates and bloggers who chatted and networked for several hours over fantastic food, product discussions and in great company at Mon Ami Gabi. The feedback was solid and more than one affiliate said it was their favorite privately held event of the week. And last but not least, not to forget a great bit of fun, ShareASale hosted their famous party under the Eiffel Tower – this year’s theme was Superheros and Villains. Not much to say about this awesome event other than I haven’t seen that many supermen and women in one place at one time, who really are, in real life, exceptionally super! What was your favorite memory of Affiliate Summit West this year? Affiliate Summit West 2013 was by far the best Affiliate Summit to date. A fabulous crowd of affiliate marketing enthusiasts and newbies gathered together to network, learn, grow and create new opportunities for each other like no other event I’ve ever been to. All 5200+ attendees were buzzing with excitement, and I was no exception. This was my first year attending with three of my team members: Carolyn Kmet, our VP of Performance Marketing, Greg White and Frank Ravanelli, two of our fantastic account managers. We sponsored a room for AIM to represent our clients, our team and meet with anyone who wanted to spend time with us, which turned out to be a fabulous experience for us. We look forward to sponsoring a room again next year. I also had the opportunity to speak at this show for the first time (thanks again to Shawn and Missy) with my friend Kush A from VMInnovations. We spoke about Affiliate Strategies for a Post Penguin World, which highlighted the importance of building communities, owning your audience to extend the lifetime value of your users, embracing social media, having authentic content, staying relevant and diversifying marketing efforts (such as introducing video) – as well as diversifying your anchor text and back linking campaigns to thrive in a post penguin world. We had a great turnout (about 100 people in the room) and I thank everyone who came to listen to us speak and learn with us. To Shawn and Missy, thanks for giving us something that allows us all to enjoy our industry so much. We look forward to many more Affiliate Summits to come. List of names, phone numbers and email addresses of people I am meeting with (if you come from other country, check to make sure your phone plan works were you are – or get a temporary phone while you’re there – personal lesson learned from last year). Camera, lip balm, and your dignity! If you miss anything else, you can buy it there. 1. Be yourself. Say Hi, smile, ask questions of other people and show genuine interest. My first summit was a huge success because I did this and people who were more veteran than I adopted me because I genuinely wanted to learn more about them and how this all worked. 2. If you have meetings, be on time or make sure you have the person’s number so you can text them if you’re running late. Sometimes meetings run longer than you think and you have to consider travel time. This happened to me at my last show and I couldn’t text the person because my Canadian roaming wasn’t letting me get texts out. She never got the message and thought I just left her sitting there. Be sure you check your numbers and plans. 3. If you’re new, check out the newcomers program. They have some awesome Affiliate Summit veterans there to help guide you and make your time there as successful and useful as possible. 4. If you’ve been to summit many times before and you find yourself meeting with the same people in the same crowds, I encourage you to break out and choose five random people to introduce yourself to. I ended up consulting for two different billionaires last year because I did this. 5. Have your goals set before you get there. Know which sessions will interest you most and that you plan to attend before the show. That way you will be organized and get what you need to out of it. Anything after that is just a bonus! Affiliate Summit West, East and Central are THE hottest affiliate marketing conferences in North America. With over 5000 attendees at both the East and West shows, with the latter next weekend in Las Vegas, attendees will get an incredible taste of the excitement of affiliate marketing through educational sessions, meet markets, networking events, an exhibitor hall, new comers program and more. I will be speaking at Affiliate Summit West at 12:30 Sunday about Affiliate Strategies for a Post Penguin World. One of my favorite affiliate networks holds their annual Shareasale Think Tank once a year and although in the past this has been an invitation only event for top tier affiliates and merchants to meet (very exclusive with about 100-200 attendees), last year this event opened to the public and was a great success. We will absolutely be attending this show this year. One of North America’s largest Digital, Search and Social conference with several thousand attendees, Pubcon also boasts a strong affiliate presence. I haven’t personally attended a Pubcon event, however it is on my list for this year as I’ve always heard positive reviews about it. This conferences is supposed to be especially good for those interested in both affiliate marketing and other channels, as the caliber of speakers on various digital topics is great. Europe’s largest affiliate event, A4U is like the European version of Affiliate Summit. This year they will make their debut in North America. One of the largest digital marketing shows of the year, AdTech will be hosted in New Delhi in February, San Francisco in April, Sydney in March, Singapore in June, London in September and New York in November. Be sure to check out their website for a full list of dates and locations. Host of the Internet Marketing Top 500 Guide and all Internet Retailer Conferences, Internet Retailer is the largest e-commerce show in the world. If you’re going to attend this event, but sure to pack some solid walking shoes and some Halls, because you will be walking for days and speaking non stop. One of the new kids on the block, Affiliate Management Days debuted last year to help affiliate managers and merchants interested in the performance marketing space to be trained by some of the top affiliate marketing experts in the world. Having several shows per year, merchants and affiliate managers alike can travel to the destination closest to them for easy access to experts and high level learning opportunities. Commission Junction University is an affiliate marketing website and event designed to help affiliates and merchants involved in Commission Junction (and the affiliate marketing space in general) succeed. It has been running since 1998 and showcases useful networking , educational and growth opportunities. One of the fastest growing shows in North America is the Online Marketing Summit. This three day event showcases in depth educational workshops, speaking sessions and networking opportunities with leaders in the digital marketing space. Though mainly focused on mobile, social and search marketing, in 2012 they introduced an affiliate marketing workshop (taught by yours truly) and have now expended to welcome several speakers in the affiliate marketing space. I will be speaking at their show in San Diego next month. From their site “In 2005, BlogHer Co-founders Elisa Camahort Page, Jory Des Jardins and Lisa Stone held a conference to answer the question, “where are all the women who blog?” Today, BlogHer conferences bring together thousands of these women from around the world to discuss, inspire and connect with each other.” BlogHer has become a must attend phenomenon that cannot be overlooked. Which are your favorite and “must attend” events of 2013? Whether your company already has an affiliate program, or you’re just starting out with affiliate marketing as a merchant, AM Days offers you the most valuable insight into how other online retailers are successfully implementing and managing their affiliate programs. I asked the conference founder, Geno Prussakov some questions today to help understand why one should attend this event. 1. What can people expect to get out of Affiliate Management Days? Three things: (1) practically applicable knowledge, (2) unparalleled professional networking (and new connections), and (3) motivation. 2. Who would be the perfect attendees for such an event? 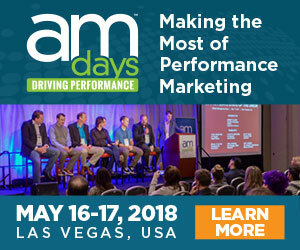 AM Days is the conference for digital marketing managers, consultants, affiliate program managers (both those who work inside advertisers’ companies, and OPMs), researchers, affiliate network reps, and affiliate management tool providers. It is also a perfect conference for those merchants who are just looking to get their feet wet in affiliate marketing. 3. Why did you start such a niche conference? While there is no lack of quality affiliate marketing conference content, we’ve never really had a affiliate management-focused professional forum. The industry is growing, and with it the need for an affiliate management-specific conference has evolved. At Affiliate Management Days we seek to address the real issues, threats, and opportunities that affiliate managers deal on a daily basis. Our speakers dissect and analyze a variety of situations (from affiliate fraud to competitive intelligence, and from legislative challenges to emerging trends), and then we collaboratively (speakers together with attendees) come up with solutions to problems and challenges. 4. How many attendees do you expect at this show compared to 5 years from now? I expect the Florida show to gather between 150 and 200 attendees. Five years from now we hope to be gathering 500-600 professionals semiannually. 5. Who are some of the big brands who’ve attended your show in the past that you’ve received positive reviews from? Amazon, eBay, Best Buy, Experian, JCPenney, Kohl’s, Zappos, Sandals, the list can go on and on. You can check out the website for testimonials from some of these great companies. Last night we held our first first annual Vancouver Affiliate Marketers Give Back event. It was a huge success and we were able to collect a variety of household and personal items for those in need in Vancouver. This year, because it was a fairly small group (10 of us in total), we held the event at my home near White Rock, BC. James and Arlene Martell (affiliates), Leanne and Peter Tremblay (affiliates), Jaxon Lam (Hootsuite affiliate manager), and half the AIM team came out to collect, sort and count donations for the Union Gospel Mission. Our total donations came to 653 items for those in need. Really fantastic! Not only did we have a great time networking while doing something to make a difference, we also enjoyed some great wine and a comfortable laid back environment to enjoy each others company, ideas and conversation. I really want to thank all those who came out and contributed to such a great event! I also want to thanks Missy Ward for letting us use her Affiliate Marketers Give Back t-shirts for a more unified look. The money we spent buying the shirts also went towards raising money for Breast Cancer which helped towards another cause as well. We encourage other affiliate markers to enjoy events such as this in their local cities. It was a ton of fun and contributes to the betterment of this industry, our surroundings and each other. I look forward to seeing everyone again in about 6 weeks for out next local Affiliate Marketing Meet-up! The Science of Influence And Persuasion by John Greathouse, a partner at Rincon Venture Partners, a venture capital firm investing in early stage web-based businesses. Panel: Inside the Mind of a Super Affiliate featuring Super Affiliates Tony Pantano of IMWave (search publisher), Kim Rowley of KIMarketing (super blogger) and Kiva Kumar of TheFind.com (shopping engine). All in all I was very impressed by the caliber of speakers and appreciated the intimate setting of about 100 attendees. This gave me the greatest opportunity to network with high caliber people in the industry. I also got to speak at the show on How to Recruit Super Affiliates – and several people approached me after including the affiliate managers from Best Buy, Ancestry.com and Sandals Resorts (who won our free affiliate program audit worth $500) to name a few. It was great to meet such fun and interesting people. I will definitely be back next year. This is the perfect show for those interested in furthering their affiliate management expertise, professional development and connections with respected colleagues.